Editor’s note: Today’s post was contributed by Edmund Serpell, from the Gaia team at ESOC. Although Gaia is not equipped with a dedicated radiation monitor, it can provide information about space weather – and the solar particles and radiation – that it encounters at its unique orbital position, L2, 1.5 million km from Earth in the direction away from the Sun. This information is useful for studies of the Sun and the interplanetary radiation environment that will be encountered by future missions beyond Earth’s protective magnetosphere. Solar cycle 24 is the current 11-year period of varying activity which peaked in 2014; it has been notable because the Sun has been much quieter in this cycle than in the preceding ones. In September 2017, however, the Sun burst into life, erupting with the largest flare of the current cycle followed a few days later by another large flare. 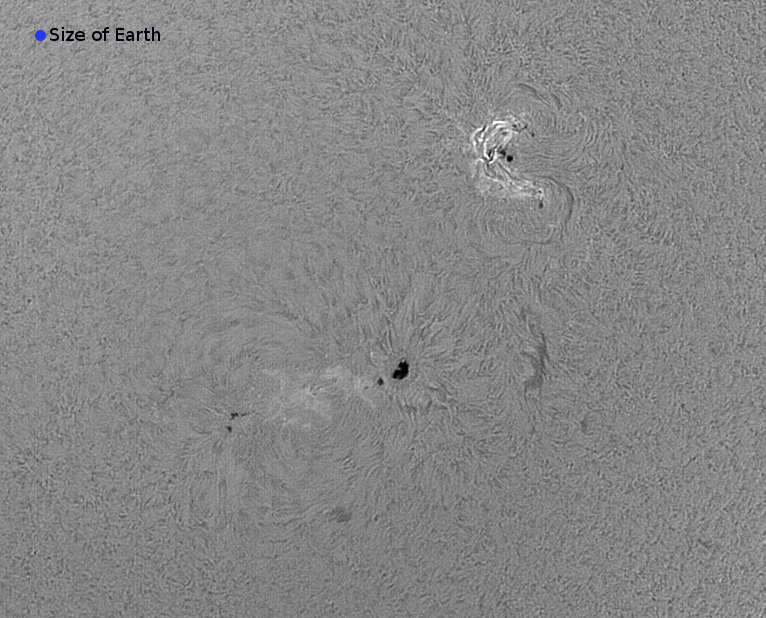 These flares were associated with a sunspot region with a complex magnetic structure (see image below) and were combined with a release of high-energy particles and coronal mass ejections. According to spaceweatherlive.com these flares, which are observed and characterised in optical and x-ray wavelengths, had peak magnitudes1 of X9.3 and X8.2 and were the 8th and 11th largest observed since June 1996 respectively (see also @esaspaceweather here and here). It is interesting to note that with two entries in the top 11, the responsible region was perhaps the second most active of the last 21 years. This is rather surprising considering the previously observed nature of cycle 24 and the timing within this cycle. 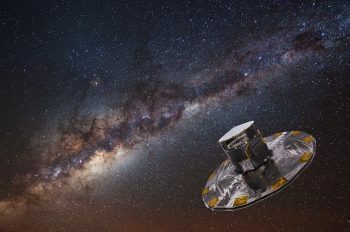 Gaia is continuously exposed to a stream of charged particles mostly emitted by the Sun, with the addition of some cosmic rays from much further away. When charged particles pass through the CCD pixels of the spacecraft’s camera, they leave trails of charge that are read out from the detector. Depending on the angle between the direction of flight of the particle and the focal plane, there can be particle trails created with lengths from single pixels up to several hundred pixels. The onboard computers of the camera are programmed with an algorithm that identifies these signals as prompt particle events (PPE), so called because the particles are high energy and therefore fast (prompt). The computers accumulate counters of these events, which are regularly sent to the ground allowing a measurement of the PPE rate to be calculated. To assess the alignment of the on-board telescopes, Gaia is equipped with a pair of wavefront sensors (WFS; essentially, small cameras) that take snapshot pictures of specially imaged bright stars. Sometimes the WFS can be tricked by the bright signal due to a prompt particle track and a snapshot of this track is captured and transmitted to the ground (see figure above). These WFS snapshots contain a wealth of data about the particles that left the tracks, including incident direction and kinetic energy. The largest particle flux measured by Gaia since launch was detected after the magnitude X8.2 flare that peaked in x-rays at 16:06 (all times UTC), 10 September 2017. The first particles are apparent in the Gaia PPE counters at about 16:20 and the first WFS images start to appear from about 16:40. The signal peak occurred in both Gaia data sets at about 00:00 on 11 September and continued until at least 12:00 on 12 September (see charts below). Although it is not known at what point during the flare the first particles were released toward Gaia, the time of arrival after the peak (< 1 hour) is consistent with the energies (>10MeV) reported by the US GOES spacecraft, which is equipped with specific particle instrumentation that monitored this event from Earth orbit. 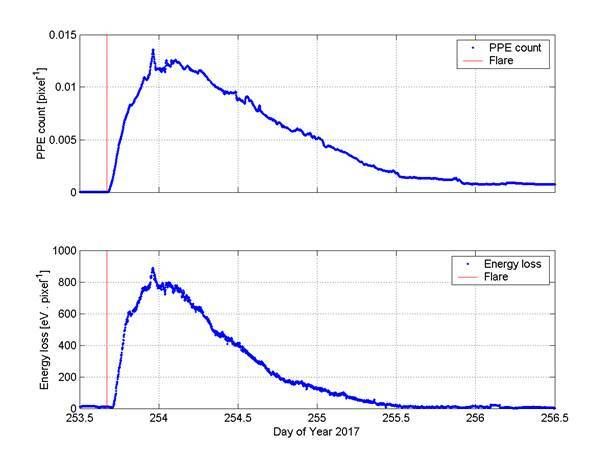 The intensity of the flare can be appreciated by inspecting WFS snapshots taken near to the observed peak (see figure above) in comparison to images from quieter periods. There is a relationship between the energy loss as a particle passes through the detector and the kinetic energy of the particle. From sufficiently long tracks it is possible to measure the energy of individual particles and it is hoped that in future an energy spectral analysis of the event will be computed. The spectacular track in the example WFS snapshot above, if it was a proton, would have had a kinetic energy of 375MeV. (1) Solar flares are classed according to the energy they release at X-ray wavelengths. There are five major categories: A, B, C, M and X, further divided into 10 subclasses. M1 flares are 10 times more powerful than C1, and X1 flares are 10 times more powerful than M1 flares, or 100 times more powerful than C1.